I have also tried to load a CD in sheepshaver (on Mac OS X 10.11.6), following your advices. Now I am stuck at the last step: "Use the SheepShaver preferences editor to add the image to the volumes list. Shut down and restart SheepShaver. The CD will show up on the desktop". As I cannot choice the preferences directly I started MacOS9 with the option key so to get the menu. When I select now number 3) I am asked: "Delete existing user data disk image, or delete and replace with a new one". Obviously it's not what I need. 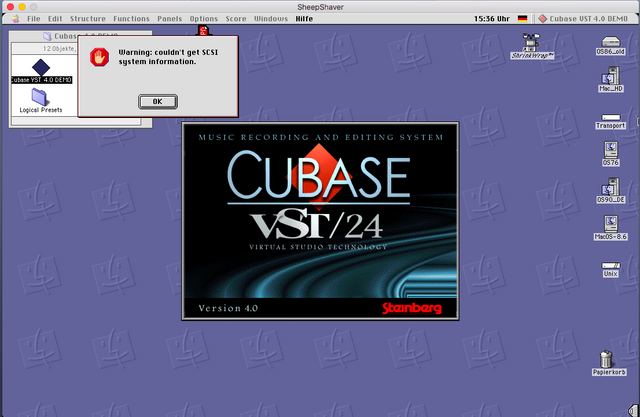 Maybe you have an advice for me so to see my Cubase VST image CD on the OS9 desktop. You apparently do not use a regular SheepShaver setup. What do you use and where did you get it? It is SheepShaver MacOS9 (2014.12.22). Honestly, I can't remember where I have found it as I am desperately trying to run my Cubase, or on my old original Mac G4 or on my 2 years old MacBook, reading a lot and looking for solutions wherever possible. Maybe on one of the OS9 Forums I found it, but I am not sure about that. So, shall I download another version of Sheepshaver? It would be a pity if somebody copied your work, maybe there is another explanation for the behaviour. When I choose "preferences" in Sheepshaver I receive an message saying: This system does not use the standard SheepShaver preferences pane. To set preferences, hold down the Option key when starting the application and use the menus. I´m not wanting to scatter anybody´s illusions, but I don´t think that Cubase VST 24 will run in SheepShaver. The app hangs in demo mode, after complaining about missing SCSI HHDs. Basilisk II build 142 and Fusion PC do have SCSI and floppy support, but both can´t run PPC apps. Another downside, there is no MIDI support in Basilisk II or SheepShaver. It seems that Cubase VST needs a special floppy for unlocking, but we can´t use floppies with SheepShaver. Maybe an image of such a master floppy would work, but I doubt it. Cubase Audio 2.X is said to be working with SheepShaver and Basilisk II. The hardware key likely was a ADB dongle, so thats another dead end, I´m afraid. I am able to open the demo version so to see my scores (in spite of having lots of error messages), unfortunately I can't print them out of the demo, so I want to authorize the Vst 4.1 score version and therefore I need to have the CD of 4.0 on the desktop (following the advices of another forum). You are running a specific pre-configured SheepShaver setup. I moved this part of the thread to the "Other SheepShaver configurations" subforum. I suppose that our member emendelson can help you with mounting the image as CD. That will not solve the need for the hardware key, though. Last edited by Ronald P. Regensburg on Wed Jun 20, 2018 7:10 pm, edited 1 time in total. it is in fact easy to load the CD image, following the advice in "Columbia.edu": one has only to drop the image on the Mac OS9 app before launching. Unfortunately there is not enough room on the disk "Mac OS 9" to copy the image. I dont't know where I could rise the dedicated memory. If you need more disk space, look back at the page at columbia.edu, and read the paragraph that begins "The virtual hard disk in the system". It tells you everything that you need to know. Hello, thanks for your advice. Meanwhile I have enough disc-space, but the Sheepshaver-version I have does not behave as expected when I put the CD on the OS9 icon; as I am told on the page of Colombia.edu:"To add or replace a disk image with this system, shut down the Mac OS 9 app and drop a disk image on its icon. You will be prompted to perform the next steps". Unfortunately I am not prompted anything, the app simply opens, and I tried with various CD-Roms. So I suppose I am missing something. Maybe somebody can guess what it might be? When you rename the disk image, use Cmd-I to make sure that the extension is NOT hidden and NOT the original extension, whatever it might have been. EDIT: I've updated the app so that it will respond in the following way if you drop a file with the extensions .hfv, or .cdr or .img: the app will ask you whether you want to copy it to the Mac OS 9 desktop or mount it. Are there any other disk-image extensions I should ask about? SECOND EDIT: I'll modify the code so that it will also try to mount a .toast image. You may want to add .iso if you don't have that already; not sure about .bin (as in bin/cue). Rename your disk image so that it has the extension .dmg, .dsk, or .iso. As it says up there, ".iso" is included. Haven't thought about ".bin". Will add that the list of file types for which I prompt the user to decide what to do with it. You may also consider adding .cdr, the extension for 'DVD/CD master' images created by Disk Utility in OSX/macOS. I've updated the app so that it will respond in the following way if you drop a file with the extensions .hfv, or .cdr or .img: the app will ask you whether you want to copy it to the Mac OS 9 desktop or mount it.